Mini gets stamp of approval | What Car? The Royal Mail hails the Mini as one of the 20th century's most iconic British designs. 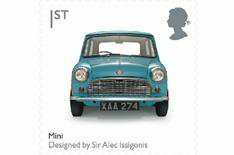 Sir Alec Issigonis's Mini is included in a set of 10 First Class stamps that picture the most influential 20th century British designs. The collection was inspired by the Mini's recent 50th anniversary and was expanded to cover other such design classics of the period. Among the other British designs joining the Mini on postage stamps are the red telephone box, Concorde, the tube map, Routemaster bus and the miniskirt. The stamps are on sale now for a year.